Quarry Bank House01535 644242work Self-cateringQuarry Bank House has been completely renovated and refurnished to a high standard to provide you with luxury accommodation for your stay with us. This spacious property sleeps up to 6 in one double, one twin bedroom and the third bedroom being a bunk bed. 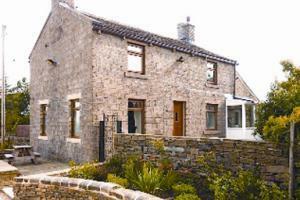 The house has panoramic views over the Yorkshire countryside and is an ideal base for visiting the area. The two story house has a living and dining room with log burner and full central heating, with large flat screen smart TV and WIFI, comfortably accommodating 6 and the new kitchen is fully equipped with double oven, gas hob, dishwasher, microwave and washer/dryer. Outside to the front and rear is a patio and sitting area with BBQ and Hot Tub. There is ample parking for your cars. Well behaved dogs are welcome. All bed linen/towels supplied, price includes all electric and Gas usage. We offer Saturday start dates for complete weeks from 1st March to the 4th January. The house is located on the outer edge of our Holiday Park and its facilities are available to guests using the House.